ECHO frequently receives questions from members of our network, asking how available land could be used to grow food and/or create income to augment an otherwise non-agricultural project. Broadly speaking, they are asking how to begin an institutional agriculture project—a coordinated agriculture effort undertaken by an institution or community of people, for the purpose of creating economic, environmental and/or nutritional benefits. 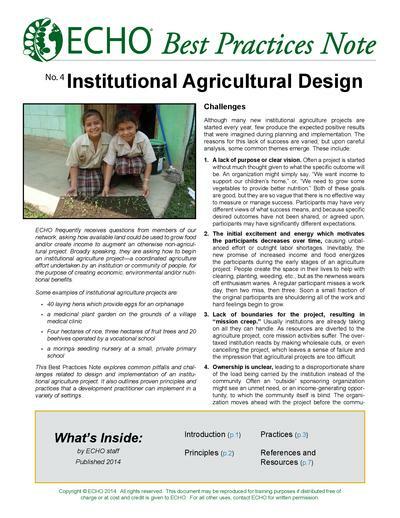 This Best Practices Note explores common pitfalls and challenges related to design and implementation of an institutional agriculture project. It also outlines proven principles and practices that a development practitioner can implement in a variety of settings.